Home / Unlabelled / The challenges are mounting up. Contingency mechanisms coping, but only just. The challenges are mounting up. Contingency mechanisms coping, but only just. The eggs from our one successful spawning (2 and a half weeks ago) have hatched, and I’m writing this blog update around 1.5 weeks after the spawning. Fertilisation rate turned out to be excellent; and the hatch rate must also have been good because we have masses of hatchlings. I don’t think it could have gone much better. That’s two years in a row we’ve had a good result from this parent set, from spawning up to the hatch stage. And this year, we’ve been able to capture and rear a higher proportion of the eggs laid compared to previous years. It’s great news and reassuring that we’ve found a repeatable approach for this parent set. Last weekend, the hatchlings were a week old, and it was time to put them out. We prepared a cage net in one of the outdoor ponds and transferred around 50k hatchlings. Within an hour, we saw some dead on the surface. And by the next morning – the surface was covered in dead hatchlings. The water was murky and we couldn’t see whether any were still alive. We theorised that the temperature difference they suffered on the move out to the pond may have been too much for them - so we cleared the surface of dead hatchlings, and moved another thousand or so; this time, floating them in a bag for an hour to equalise the temperatures, before releasing them. The next morning – same result. At this point, I was struggling to understand the problem, but the look of the algae was different to normal, and perhaps it was part of the cause. The algae is red coloured – and the very colour of it lights up instinctive warning alarms. But, I’m out of my range of experience and knowledge – and bottom line is that I don’t know what the root cause is. 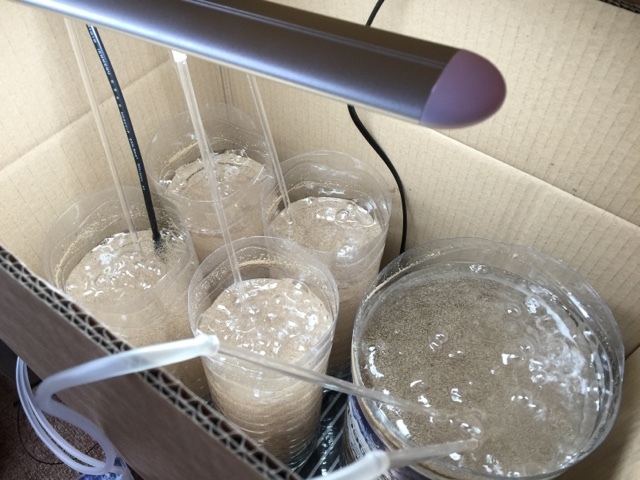 To further develop our understanding of this type of algae, we tried some more tests on smaller quantities of hatchlings – and low and behold, it turns out the hatchlings are not surviving in that water. The water appears to be poisonous! A bit of research online, and turns out some algae creates water that is poisonous to fish! 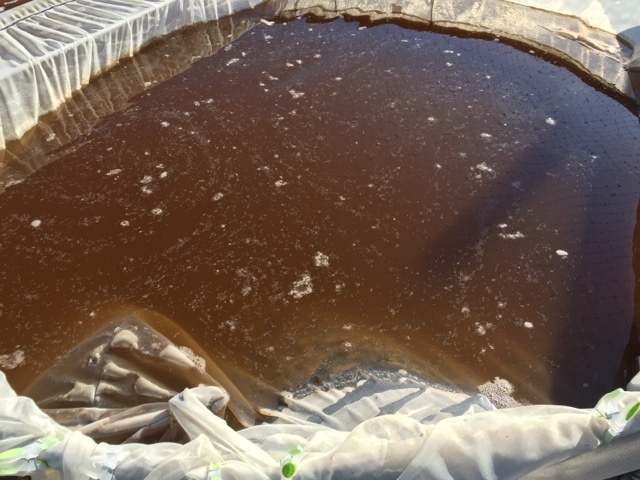 If we assume the algae is the problem - both outdoor ponds are presenting the same colour – and therefore, both ponds are basically, poisonous to fish! The timing couldn’t be worse. 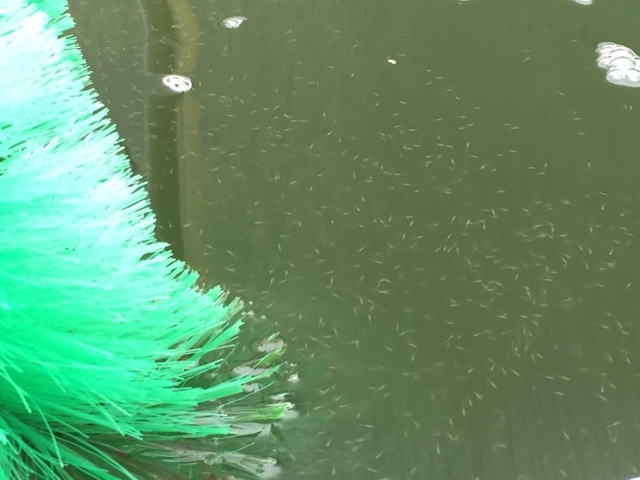 I have a bumper hatch of my tried and tested kohaku parent set ready for the fry ponds – and the water is poisoned! On the upside – in previous years we’d introduced all the hatchlings into the pond and probably lost the lot; and scrubbed out the fry pond in the process too. At least this year, we still have around three quarters of the hatchlings alive and well. We still have more than enough hatchlings, and we’ve been using our new contingency methods to sustain them. 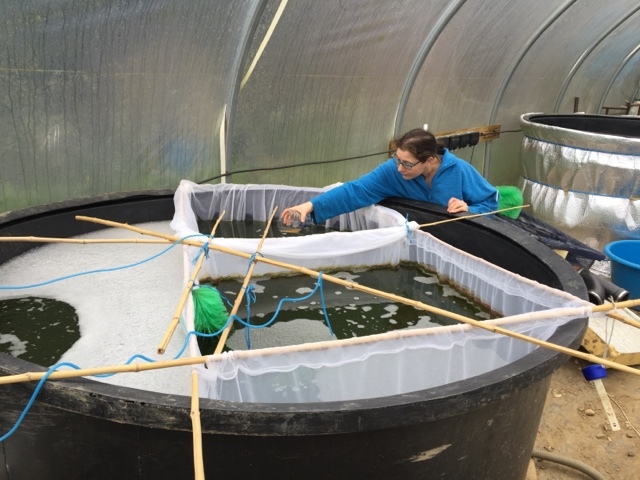 Rearing brine shrimp has been scaled up, and feeding, setting up new bottles with cysts etc is continuous work – and Amanda is taking the brunt on this. The whole spawning would have been lost without her efforts. Through Amanda’s efforts, the hatchings left in the rearing tanks in the polytunnel are doing quite well. The cage nets Amanda made over the last few weeks are coming into their own. 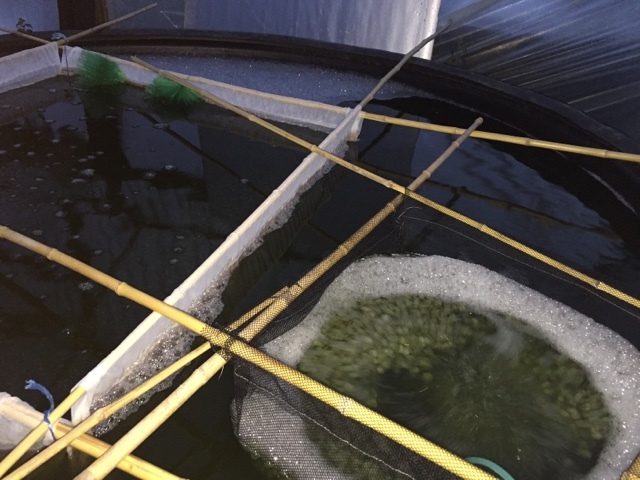 And we are facing up to the prospects of rearing them solely in recirculation ponds in the polytunnel. 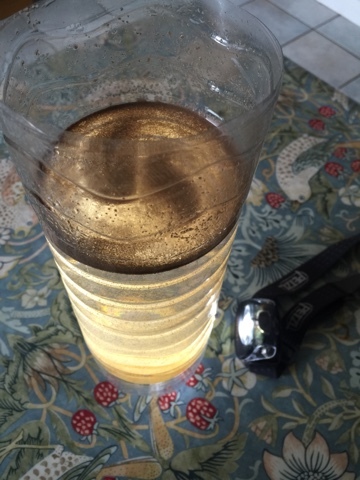 We have a few more tests on the water in the ponds outside – but I suspect our best course of action is to drain them, re-line and start again. Starting again would mean a 7 week lead time before they’re ready for fry, so we’d only get one more shot at each pond this season, before we run out of summer! Seems crazy to be talking about the end of summer before summer has technically started. But, that’s the situation we face. Unless we can find a way to rear the hatchlings artificially (which many people do successfully, but it’s a new approach for us), then our season has effectively been halved by the rogue algae. Our 3 years of experience is helping us make the best out of our current situation – but come on…. both ponds outside made poisonous to fish because of a freak algae bloom! Its ridiculous. On top of the parent fish losses the other week. We have to laugh, otherwise , quite frankly we’d cry.